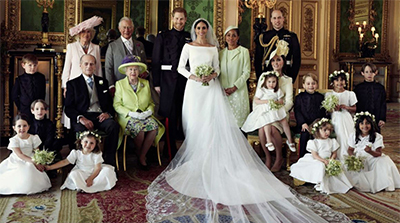 Estimates are that 2 billion people watched Prince Harry marry Meghan Markle on Saturday, but wedding professionals watched with an especially educated eye. Here, we present the takes of eight wedding professionals as they share their expert comments on the innovative affair: the floral, her gown, and those chairs …. “I was initially disappointed that we wouldn't get the iconic balcony kiss until it became incredibly clear that the dramatic floral arch at the entrance was going to serve as the perfect backdrop for the moment. As it turns out, it created an even better picture of the couple shot from behind the arch. It was exquisite.” —Meghan Ely, OFD Consulting, Richmond, Va.
“I have to admit at first look—which was a long view—I wasn't crazy about the floral installation on the front of the church. However, once I got a closer look, I did fall in love with it. From a distance it was hard to see anything beyond all the greenery, but as you got closer you could see the floral that was incorporated in. The floral installation inside the church was just stunning and impeccably done. It, as well as the outdoor install felt fresh, lush and like spring! I'd read the florist incorporated floral elements that existed there locally, which lent the look a very natural, organic feel, especially on the outside of the church. It almost looked like it had been there for forever!” —Cyndi Basker, Celebrated Events by Cynthia Basker, South Bend, Ind. “In concept, I loved the greenery/floral arches. I thought in places they looked sparser in florals then I would have personally preferred. I was expecting the floral to look a little more refined, and streamlined and not as garden-inspired, but lovely nonetheless.” —Ashley Stork, Magnolia Vine Events, Birmingham, Ala.
“Meghan Markle’s bouquet, although on the smaller side, totally completed her overall bridal look. The simplicity of the bouquet's composition allowed us an opportunity to focus on her glow and other details, such as her tiara!” —Bron Hansboro, The Flower Guy Bron, Richmond, Va.